It’s been quite a year for Mark Zuckerberg and his friends at Facebook. You might even say that 2018 has been the single worst year in the company’s history. But you wouldn’t know it by reading “Facebook’s 2018 Year in Review.” The annual blog post leaves one with the impression that Facebook’s involvement in global events was nothing short of heart-warming. In truth, it was not. Facebook left a few things out its year in review—a lot. The social network’s list includes events like the Royal Wedding, the World Cup, the Super Bowl, and International Women’s Day, but seems to omit more Facebook’s involvement with things like genocide, election interference, privacy violations, data breaches, executive malfeasance, and conspiracy theories. Basically, Facebook wants you to know that positive global events did happen this year, and people talked about them on Facebook. America’s midterm elections are mentioned in passing. Again, Facebook’s role in 2018 was not all sports balls and wedding bells. It actually played a pretty evil part in many events! So to spare you from trying to make sense of the company’s sanitized version of history, we’ve compiled a list of our own that includes the things that Facebook forgot. The world feels anxious and divided, and Facebook has a lot of work to do — whether it’s protecting our community from abuse and hate, defending against interference by nation states, or making sure that time spent on Facebook is time well spent. My personal challenge for 2018 is to focus on fixing these important issues. We won’t prevent all mistakes or abuse, but we currently make too many errors enforcing our policies and preventing misuse of our tools. If we’re successful this year then we’ll end 2018 on a much better trajectory. under Facebook never had a chance. Although the U.S. presidential election happened in 2016, Facebook was still dealing with the fallout in 2018. Just as Zuckerberg said in his New Year’s resolution letter, the company must work constantly to prevent more incidences of Russian interference or interference from any other nation. That’s why Facebook’s vice president of advertising Rob Goldman got into so much hot water when he tweeted, “I have seen all of the Russian ads and I can say very definitively that swaying the election was *NOT* the main goal.” Donald Trump retweeted Goldman, implying that this statement served as proof that the “Fake News Media” was tricking the America about what Russia did. The public freaked out. Goldman apologized and kept his job at Facebook. You better believe that his boss Mark still wishes people didn’t believe that Facebook did not help Russia pick an American president, though. That would be crazy. This was a big whoopsie. In March, Facebook booted the UK-based data firm Cambridge Analytics from its platform for improperly obtaining the personal data of up to 87 million users. What made matters worse was the fact that Facebook had actually known about the issue since 2015 and instructed the firm to delete it. Cambridge Analytica had also been hired by the Trump campaign, a fact that reportedly drew scrutiny from special counsel Robert Mueller for his investigation into Russian election interference. All this led to a catastrophically bad scandal, one that Mark Zuckerberg seemed to avoid in the days after the details became public. But the company couldn’t avoid the subsequent inquiries from folks like the FTC, Congress, and the House of Commons. 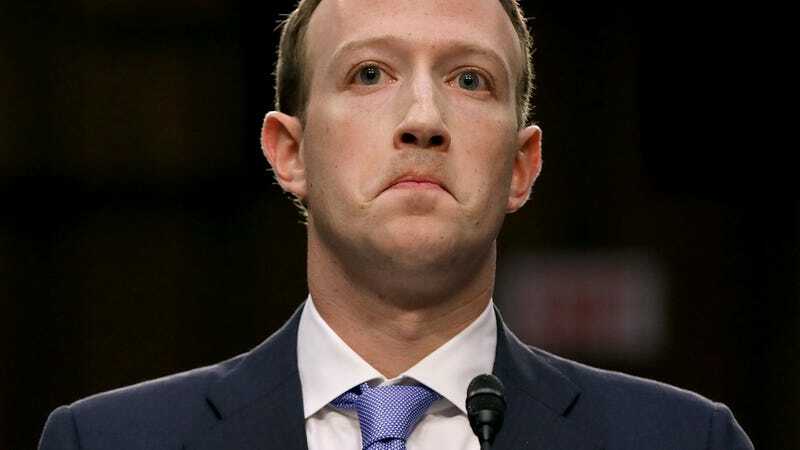 Zuck eventually testified on Capitol Hill where, as one person pointed out, he looked like “the guy in a zombie movie who’s been bitten but is trying to keep it a secret from everyone.” The 33-year-old Facebook CEO ended up not answering a lot of questions. Facebook was used in Myanmar to spread hatred about Rohinga Muslims in a violent campaign that forced over 700,000 of the minority group from the predominantly Buddhist country, according to United Nations investigators. In the end, observers say thousands of Rohingas were massacred, and members of the military systematically gang raped Muslim women and girls. Although the genocide occurred over the course of a few years, it was in 2018 that UN investigators officially acknowledged Facebook’s role and called the situation in Myanmar “a textbook example of ethnic cleansing.” The UN also said that Facebook was “slow and ineffective” in dealing with the hate speech on its platform. When the issue had finally attracted international attention and widespread criticism, Mark Zuckerberg eventually admitted that hate speech was “a real issue” on Facebook. This was, of course, after countless Rohinga Muslims had been massacred. In the immediate wake of the Cambridge Analytica scandal, Mark Zuckerberg took the stage at the annual F8 developers conference and announced that Facebook would soon offer dating features. Okay! There’s a longstanding theory that Facebook secretly accesses the microphone on unsuspecting users’ phones in order to eavesdrop on conversations and better serve ads. This probably isn’t true, according to a 2018 study from researchers at Northeastern University. However, the reality of those creepy targeted ads is perhaps even more unnerving than the conspiracy theory. Facebook can track you even when you’re not on Facebook thanks to a piece of code that advertisers put on countless websites. This practice attracted extra attention this year, when Senator Roger Wicker asked Mark Zuckerberg about it while the zombie-like CEO was testifying before the Senate Judiciary Committee. Zuckerberg dodged the question. The acquisition of WhatsApp and Instagram helped make Facebook the giant that it is today, and in 2018, Facebook chased away those companies’ founders. WhatsApp co-founder Jan Koum quit his job at Facebook in the spring, not long after fellow WhatsApp co-founder Brian Acton told the world to delete Facebook. Instagram co-founders Kevin Systrom and Mike Krieger left in the late summer. It’s not unusual for founders to seek out new projects after their companies get acquired. It is weird that all of these guys decided to do it at once. In late September, Facebook revealed a massive security breach that affected up to 50 million login tokens. It was a bad one, too. The hackers were able to take over accounts of the affected users, and are believed to have stolen the sensitive personal information of 27 million people. That data included everything from names, relationship statuses, and locations to recent Facebook searches and page likes. Users sued Facebook pretty much immediately over the breach, and the company faced huge fines in Europe. The breach hurt Zuckerberg and friends especially bad since it happened just a few months after the Cambridge Analytica scandal. Heck, Facebook was still getting hit with fines for that debacle. It was bad.